Clinton County Bulldog Chase Stines was fouled as he put up this shot Monday night in Edmonton during opening round action of the 4th Region All “A” Classic basketball tournament. The Dawgs won the tournament game, defeating Metcalfe County 68-44 and Stines finished with 20 points. 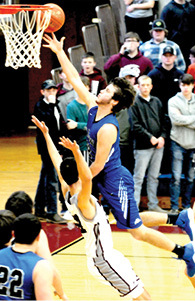 Clinton County next travels to Elkton to take on Monroe County in semi-final action, with hopes of advancing to Friday night’s championship game and the crown jewel of returning to next week’s All ‘A’ Classic State Tournament in Richmond, Kentucky.